I had so much fun painting these nails! The rainbow, butterfly, and flower designs are so pretty. They’re even cuter in person. I look at them often – well, a LOT. I’m excited to show them to you. Now that it’s spring, these rainbow colors give me a bright cheerful look. My nails are still as pretty as the day I painted them. No worries about avoiding dishwashing to make them last. I tried several different designs but these were my favorite. And I kept my nails long so I’d have plenty of room for a design. These tips will help you make dotted nail designs. Use the right tools. 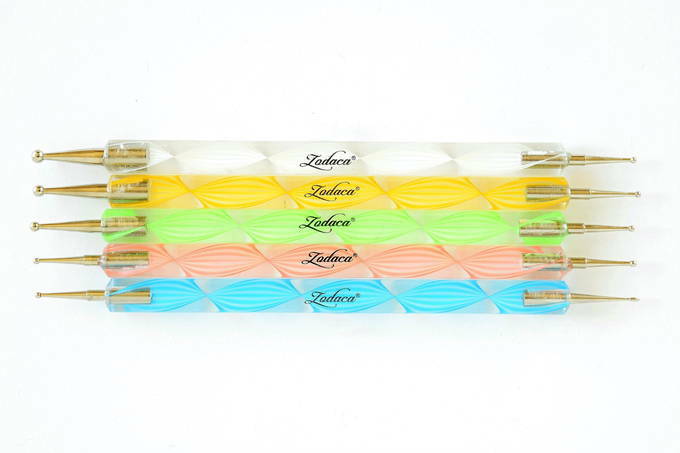 Buy nail art dotting pens to paint small to large dots in such a small area. You can’t just depend on the bottle’s brush or a regular size dotter. – the amount of paint you put on the dotter. It takes time to do it well. If a nail doesn’t work out, take the paint off and redo it. If a dot is not in the right place, use a fine tipped tweezer to scrape it off. Use reading glasses – so you get a magnified view of what you’re doing. Put one or two drops at a time on a paper plate (palette) – it dries quickly. And don’t dip into the bottle – so you can control how much paint gets on the dotter. Use or adapt a design so it fits your nail size. You can’t fit a large design on short nails. Here are the rainbow colors you’ll need to make these designs. This was my very first time using these special nail art dot pens – I promise! You can bet I’ll be making more designs now that I have these cool tools. It was fun to paint a butterfly and flower design on my nails. It was so great to see it all come together. 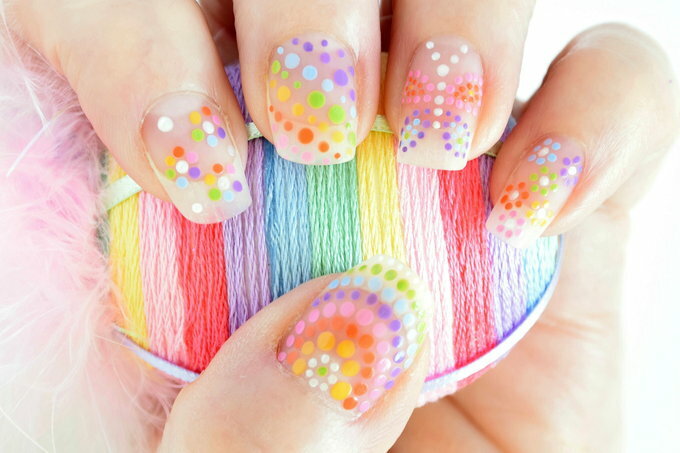 But even if you don’t make dots, these spring colors will make your nails look cute.